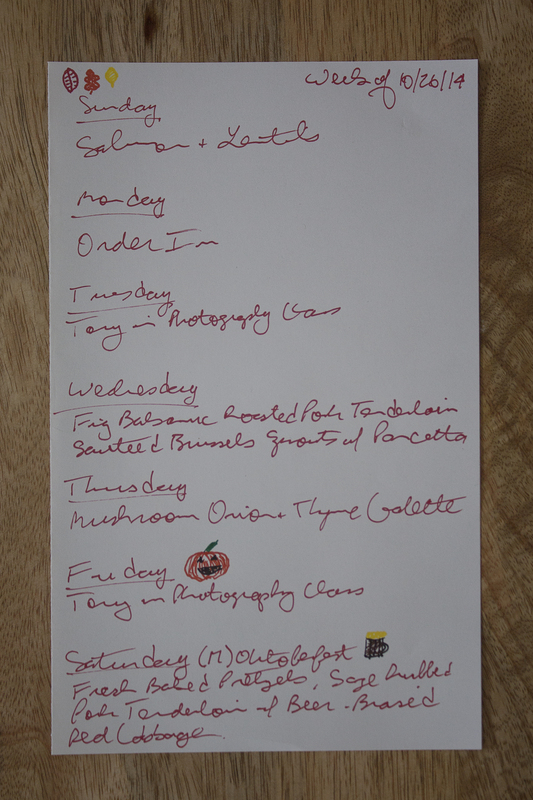 We’ll only be making four dinners this week, as we have plans to attend a lecture Monday night, so will probably eat out, and Tony has photography classes Tuesday and Friday night, so Kim will be on her own. We’re still going to make some fun things, including a whole Oktoberfest menu to enjoy with our good friends Krista and Lynee on Saturday. On Sunday night, we’re making Ina Garten’s Salmon with Lentils, which we made once before and loved. The secret ingredient in French lentils that we bought at an outdoor market in Paris. Not only will this dish be delicious, it will also bring back fund memories of a wonderful trip. On Wednesday night, we are making two new recipes, both from Skinnytaste (www.skinnytaste.com), Gina Homolka’s fantastic Web site. We’ll be making Fig Balsamic Roasted Pork Tenderloin as the main course and Sautéed Brussels Sprouts with Pancetta as a side. This may seem a bit ambitious for a weeknight, but pork tenderloin cook relatively quickly. Plus, we’re saving some time on the prep side by buying pre-shredded brussels sprouts from Fresh Direct (www.freshdirect.com). We have another somewhat ambitious recipe planned for Thursday night too: Mushroom, Onion and Thyme Galette from the Hip Foodie Mom blog (www.hipfoodiemom). Tony’s been wanting to try to make a galette for some time and this one sounded too good not to try. Making a pastry crust is definitely not part of an average weeknight for us, but our hope is that doing a little prep in advance (like measuring out flour and slicing the onions) combined with ordering pre-sliced mushrooms and using a food processor to make the dough will allow us to get dinner on the table at a reasonable hour. We’ll be sure to let you know how the experiment works out. Last but not least is an Oktoberfest dinner on Saturday night. (We know it will be November by then, so it may be more of a Moktoberfest, but we’ve been thinking about this for so long, that we don’t care!) We’re going to start with Alton Brown’s Homemade Soft Pretzels, which we’ll serve with at least two kinds of mustard. These are a lot of work (you have to make the dough; roll it out and shape in into a pretzel; boil the uncooked pretzel briefly and then bake it) but absolutely, totally worth it. For dinner, we’re going to modify two recipes, taking the best parts of each to make something new. We’re going to take the rub from Ellie Krieger’s recipe for Sage Rubbed Pork Chops with Warm Apple Slaw and the cabbage from “Bon Appetit”‘s Beer-Marinated Pork Tenderloin with Red Cabbage and combine them into a dinner of Sage Rubbed Pork Tenderloin with Beer Braised Red Cabbage. For dessert, we’re going to make Single-Serve Apple Crumbles using the Summer Fruit Crumble recipe from Christian Constant’s “Notes from My Kitchen” cookbook. These crumbles are spectacular – the topping is not too sweet and contains almonds, which give it a much deeper flavor than traditional crumble topping – and we’ve been able to adapt them for use with apples and even pears.